THIS WEEK AT BEAR CREEK: Icy Trails and…Frozen Frogs? 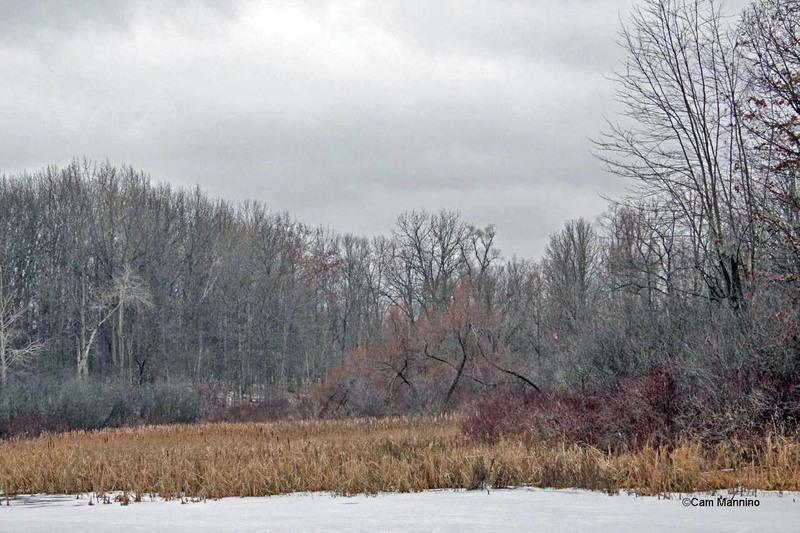 The red blush of Red Osier Dogwoods (Cornus sericea) at the edges of Bear Creek’s wetlands provides very welcome color in the brown, gray and white world of a Michigan winter. The last week of the year, tiny beads of ice fell from the sky for hours, covering the trails and making for tricky walking. But at least you’ll never lose your way! Though the fields are mottled brown and white, the icy trails shine bright white in the landscape. And deer trails through the thickets are readily apparent, too. The icy trail around the center pond is readily apparent from a distance now. Deer paths through the thickets stand out now that they are white with ice. Bare branches and ice make it possible in the winter to really see the southernmost pond in the park near Snell Road. It’s hidden by surrounding foliage in the summer which probably is why so many warblers and other migrants spent time there in the spring and fall. 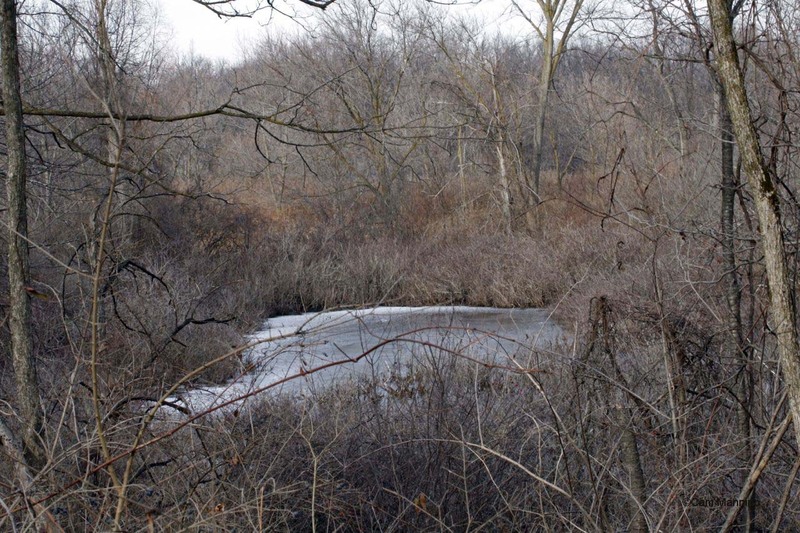 Bear Creek’s southernmost pond near Snell Road is most visible in the winter. A Muskrat (Ondatra zibethicus) at the marsh had evidently walked across the icy slush either to or from its feeding push-up before the slush turned to ice. Perhaps you can just make out its frozen footprints in this photo. 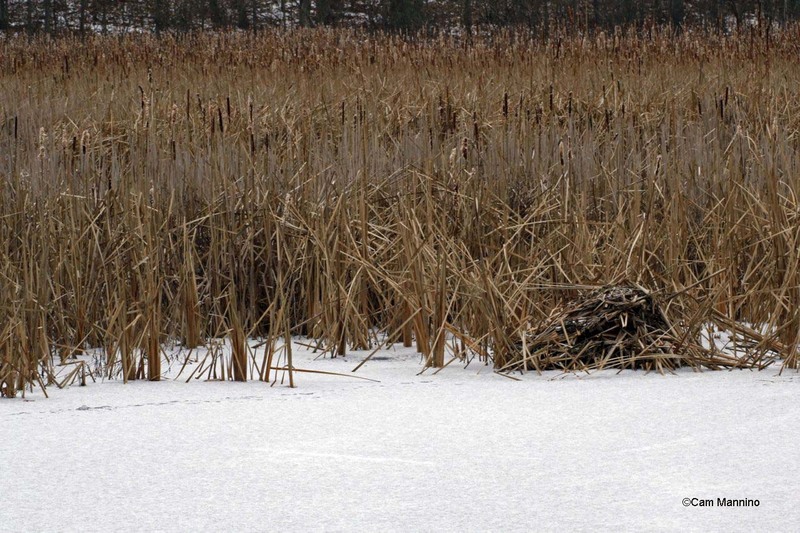 A muskrat left a trail in the icy slush that led to or from its feeding push-up in the marsh and across the ice. A group of hardy American Tree Sparrows (Spizella arborea) repeatedly darted from low bushes down onto the reeds of the marsh. What could they be finding to eat? Perhaps seeds, perhaps some frozen insects that mistakenly hatched in the unseasonably warm weather before the ice? No doubt skills these little birds developed on the tundra during the summer make finding food here seem like fledgling’s play! Aren’t they nicely camouflaged for this grey and brown time of year? 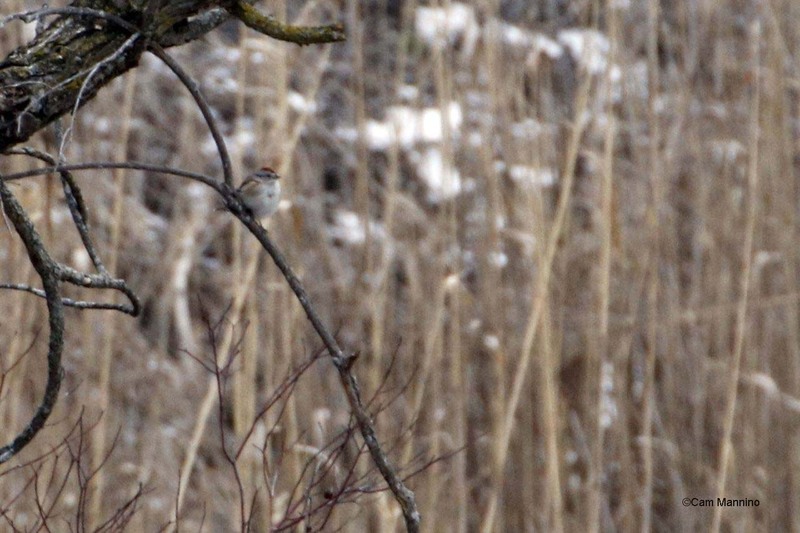 A Tree Sparrow finding food in the frozen marsh. Mallards (Anas platyrhynchos), of course, found a small area of open water where they could feed. Most of their compatriots have moved south a bit, but some still probe the depths at the Center Pond and the marsh. 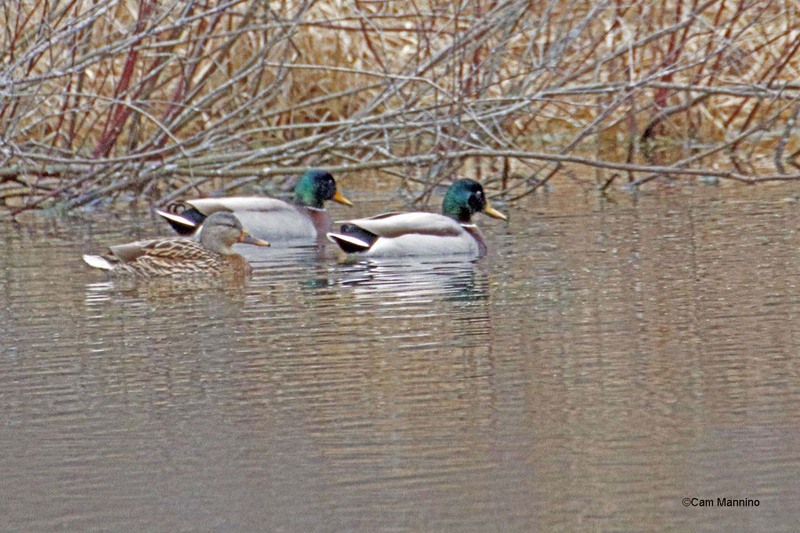 Mallards find a small area of open water. Ice takes so many beautiful forms this time of year. Forming on the Playground Pond , it looked as though it were embossed on some elegant blue/gray satin. 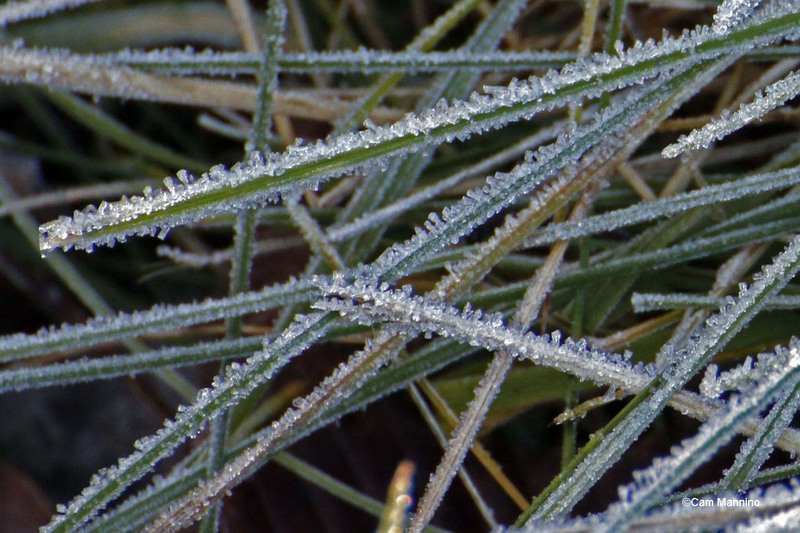 On grass stems, heavy frost looked granular and spiky. 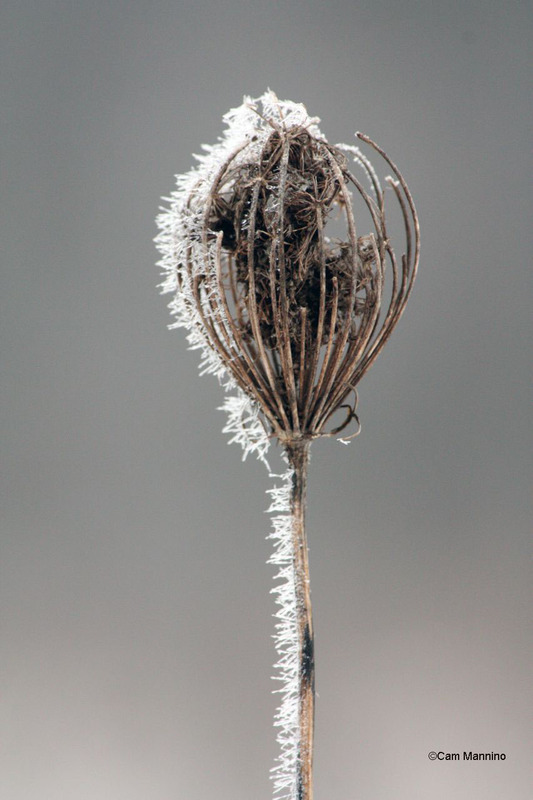 And doesn’t heavy frost also do a lovely job of tracing the shape of this Queen Anne’s Lace? Winter is a time of ice and stark shadows so be prepared for more photos of both as the season moves on! It’s true that some frogs, like the ubiquitous Green Frogs (Rana clamitans) of the Center Pond, are spending the winter under the pond ice. Like the turtles, their metabolism slows drastically to preserve their oxygen during hibernation. Unlike turtles, though, they can’t bury themselves in the mud because they need to absorb oxygen from the water through their skin. 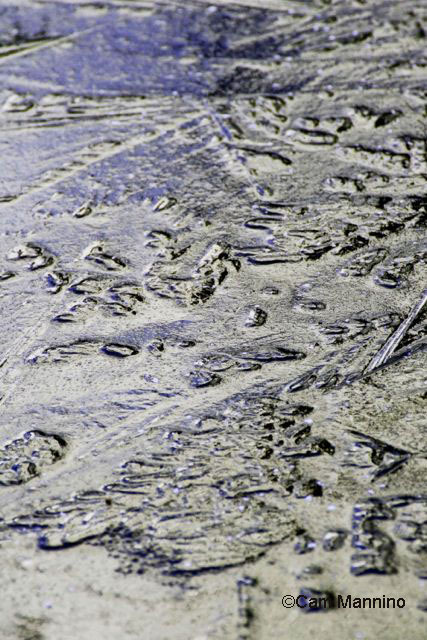 So they may have a light coating of mud or simply lay inert on the pond bottom waiting for spring. At times, they may even swim slowly through the water. 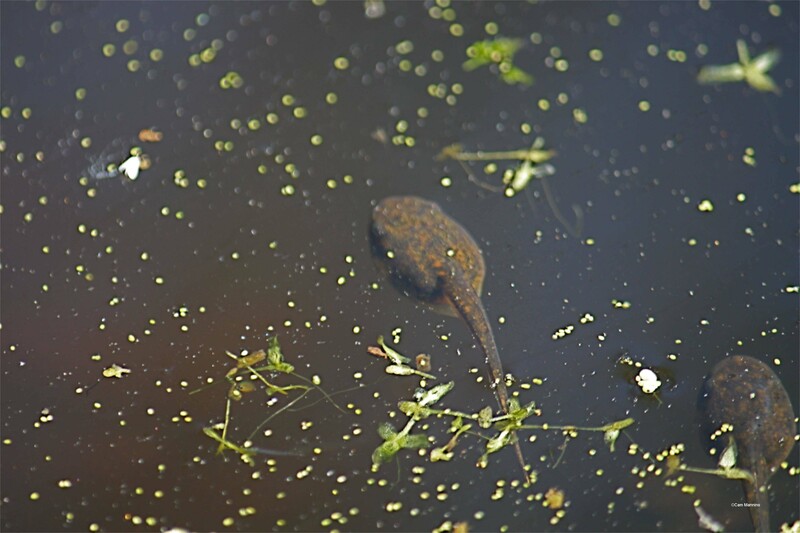 It can take 2-3 years for a Green Frog tadpole to develop into a frog, so some of their tadpoles are below the ice as well and are reportedly a bit more mobile than the adult frogs. 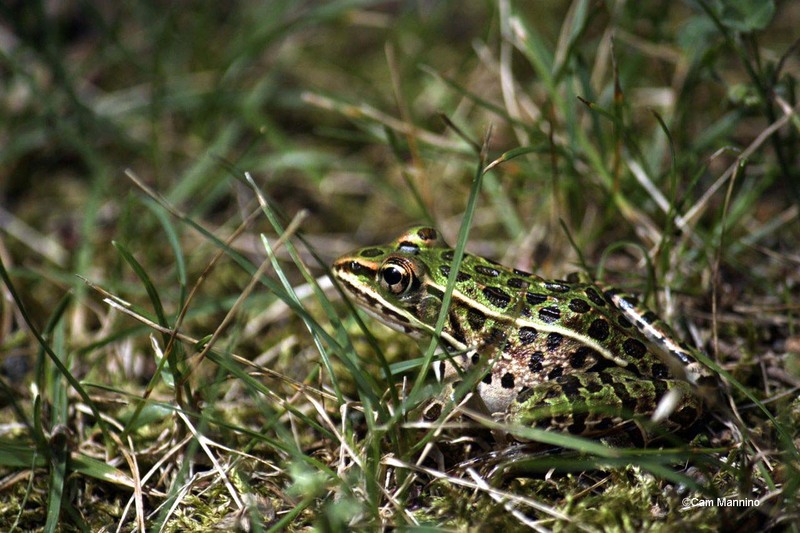 The striking Leopard Frog, less common in Bear Creek and across the state, also hibernates below the ice. The Northern Leopard Frog also hibernates on the bottom of ponds at Bear Creek. Incredibly, the smallest frogs of early spring actually freeze in the winter and thaw out in the spring! The Wood Frog (Rana sylvatica), for example, finds a crevice in wood or a rock or simply under leaves, and waits. 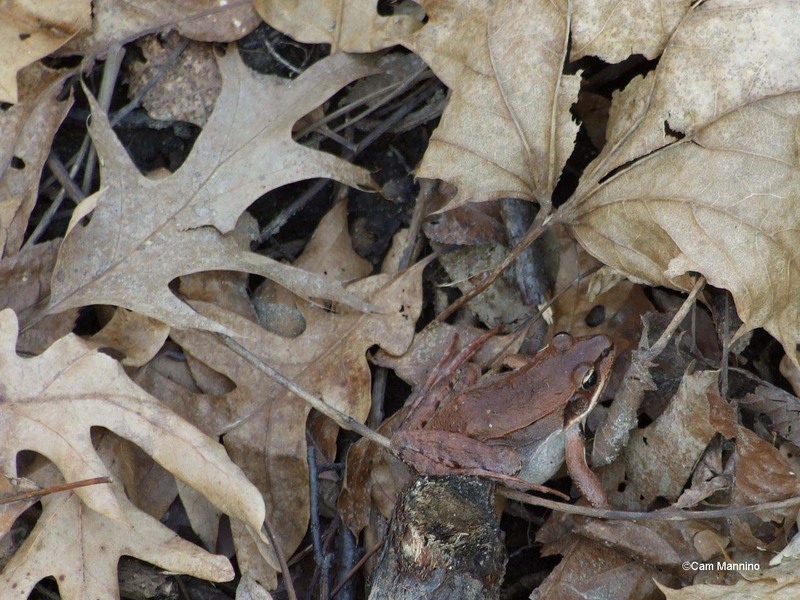 A Wood Frog burrows into leaves for the winter, freezes, stops breathing, no heartbeat – and then thaws in the spring! According to biologist Bernd Heinrich in his book, Winter World, when ice begins to form on any part of its small body, an alarm reaction makes a Wood Frog release adrenaline which signals the glycogen in its liver to turn to glucose which functions like anti-freeze. “In about fifteen hours, the frog is frozen solid except for the insides of its cells. Its heart stops. No more blood flows. It no longer breathes. By most definitions, it is dead.” But they thaw in the spring! As Scientific American describes it, “…when the hibernaculum [the place where an animal hibernates] warms up above freezing, the frog’s frozen portions will thaw, and its heart and lungs resume activity–there really is such a thing as the living dead!” How amazing is that, eh??? Spring Peepers (Pseudacris crucifer) and Chorus Frogs (genus Pseudacris) can do this as well. These small frogs live mostly on land. Once they thaw, however, they quickly go to vernal pools to breed. 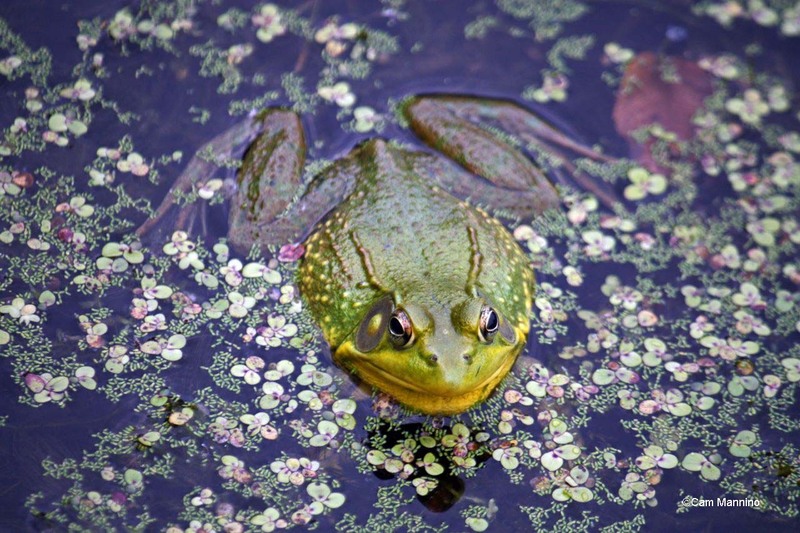 Because vernal pools are created from snow and ice melt, these frogs do better after a snowy winter. Their frozen hibernation in shallow places allows them to thaw quickly in the early spring and mate in these temporary pools, safe from predators like fish or turtles who need permanent ponds. 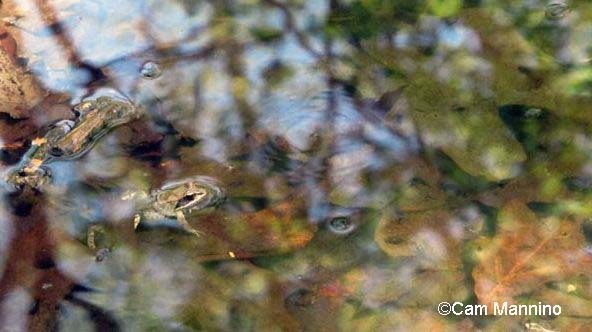 The tadpoles of these early spring species become frogs much more quickly than the Green Frog’s do, in a matter of weeks or months, since the vernal pools, like the one near Gunn Road, shrink or disappear as summer comes on. So nature does it again! 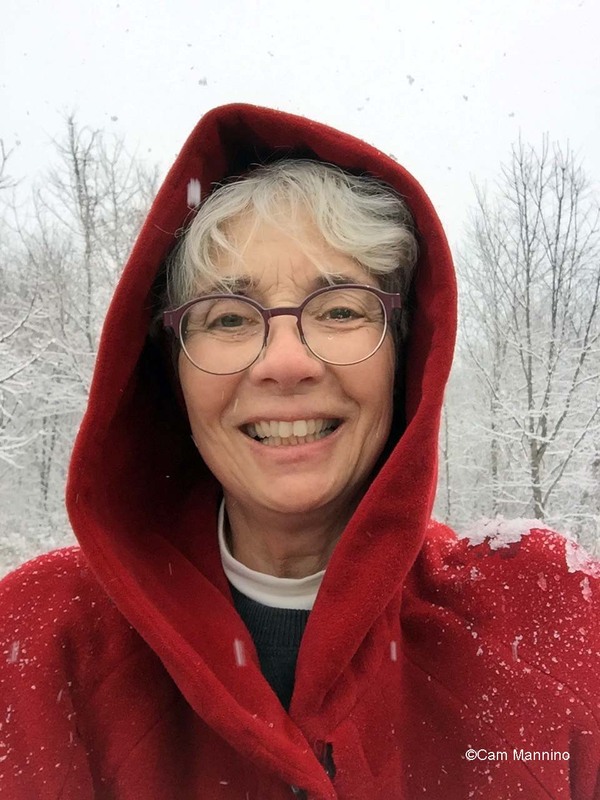 As we tread gingerly along the icy paths of Bear Creek, we can imagine Green Frogs sprawled along the bottom of the pond and tiny spring frogs frozen under leaves or in tree bark waiting for an almost literal rebirth in the spring. We humans use our complex brains and fire fueled by ancient plants to survive an icy winter, while little frogs use massive amounts of homemade antifreeze. Ice requires a lot of different adaptations for survival and over thousands of years, nature, as always, finds a way. *Footnote:  As well as Oakland Township Stewardship Manager, Dr. Ben VanderWeide, my sources for information are as follows: Ritland, D. B., & Brower, L. P. (1991);Stokes Nature Guides:  A Guide to Bird Behavior Volumes 1-3, Allaboutbirds.org, the website of the Cornell Ornithology Lab at Cornell University; Wikipedia; http://www.butterfliesandmoths.org; Herbarium of the University of Michigan at michiganflora.net; various Michigan Field Guides by Stan Tekiela; Butterflies of Michigan Field Guide by Jaret C. Daniels; University of Wisconsin's Bug Lady at www4.uwm.edu/fieldstation/naturalhistory/bugoftheweek/ for insect info http://www.migrationresearch.org/mbo/id/rbgr.html for migration info; invaluable wildflower identification from local expert, Maryann Whitman; experienced birder Ruth Glass, bird walk leader at Stoney Creek Metro Park for bird identification; Birds of North America Online; Audubon.org, Nature in Winter by Donald Stokes, Trees in My Forest by Bernd Heinrich, Winter World by Bernd Heinrich, Savannah River Ecology Lab (Univ of Georgia), Tortoise Trust website www.tortoisetrust.org and other sites as cited in the text. Amazing photos! Even in the gray days of winter there is beauty! Thanks, Colleen. I’m glad you liked the photos. It’s true that even gray days have a beauty of their own. Sometimes I have to work on remembering that when the gray days go on too long! But I’m never disappointed once I get to the park. I’m glad that you are finding Bernd Heinrich’s books helpful and interesting. I’m reading his 2014 book – “The Homing Instinct – Meaning and Mystery in Animal Migration”. It is truly fascinating. I’ll return it to the library soon. Thanks again for making me aware of Bernd Heinrich! I’ll look for that one about migration at the library when you’re done. The one on trees was great too.